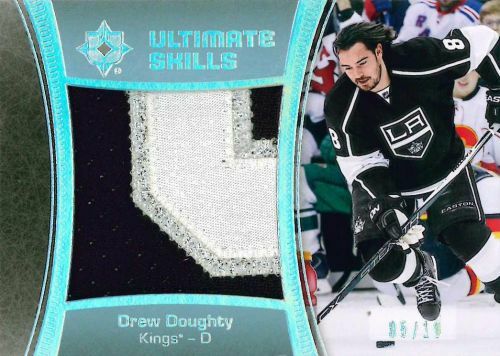 Upping the hit totals again, 2015-16 Upper Deck Ultimate Collection Hockey sees an increase for the second straight year. 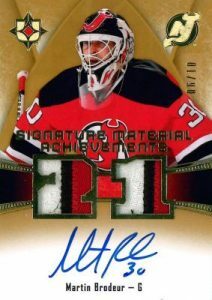 Each box promises five total autographs or relic cards and all signatures are hard-signed. 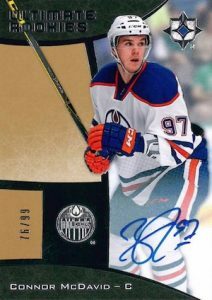 Increasing from two hits in 2013-14 and four hits in 14-15, collectors will also likely be impressed by the on-card autographs that fill the release in addition to the fifth hit. 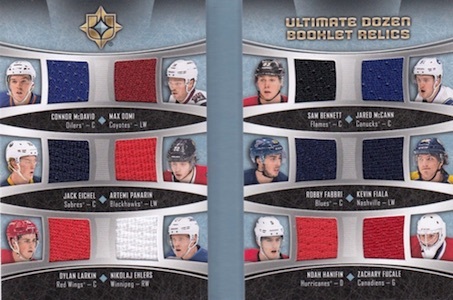 2015-16 Upper Deck Ultimate Collection Hockey starts off with a base set that only features relics and print run of 199 or 99. Along with that are multiple relic and autograph relic parallels and even more rarity. 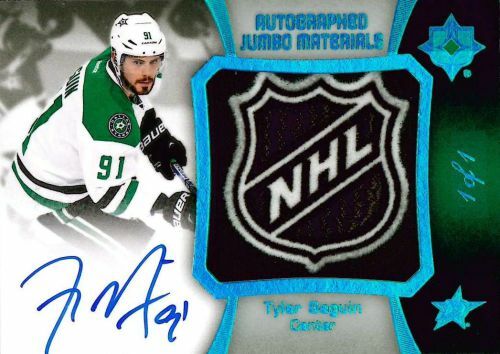 The hit-centered 2015-16 Upper Deck Ultimate Collection Hockey also features a mix of autograph and relic insert. Among signed cards, highlights include Autographed Ultimate Rookies (#/299 or #/99) and the 2005-06 Retro Rookies Autographs (#/249 or #/149). Each is found in various Patch and Autograph Patch versions as well the elusive one-of-one Shields. Upper Deck also revealed that the Shield versions are exclusive to physical packs whereas most of the other cards can be pulled in both standard packs and ePacks. 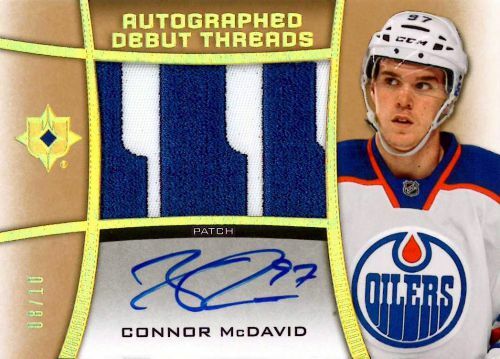 Also focusing on the top young players, including 30 key rookies like Connor McDavid, Debut Threads Jersey (#149) and Patch (#/5) are joined by Autographed Debut Threads Jersey (#/99) and Patch (#/10) cards. 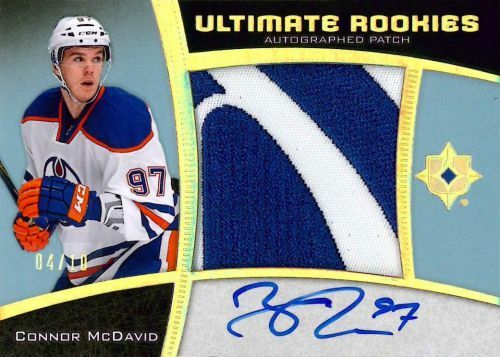 Additional options found in 2015-16 Upper Deck Ultimate Collection Hockey include Honoured Materials (#99 or less), Iconic Fabrics (#/65 or less), and Material Achievements (#/99 or less) relics that also come as signed versions. 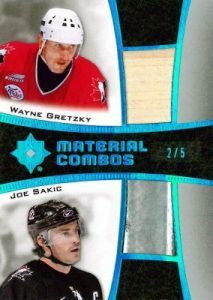 Featuring Combos, Trios, Quads and Sixes, Ultimate Materials pair multiple relic swatches on the same card. 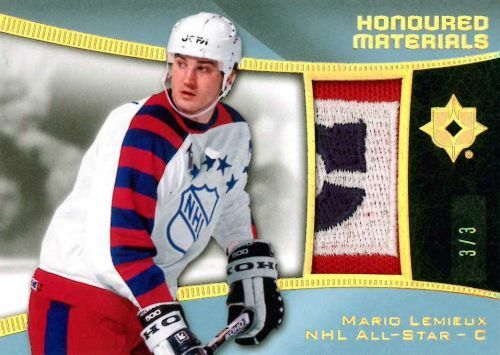 Other notable memorabilia cards include Ultimate Jumbo Materials (#/40) with a 1.625" swatch. 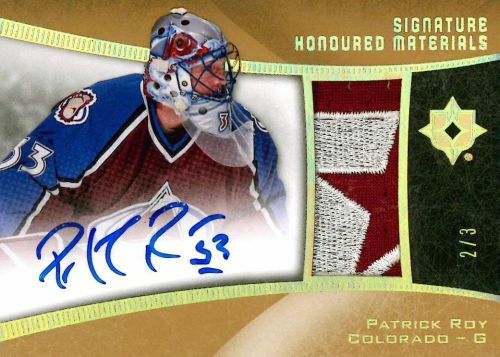 The Jumbo Materials also come as Signed Patch and Shield parallels. 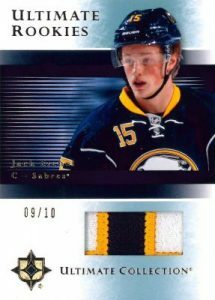 UPDATE: It has been announced that 2015-16 Upper Deck Ultimate Collection Hockey will be included in the e-Pack program with an estimated release happening sometime after the physical release. RELIC PARALLEL CARDS: Gold Patch #/15, Platinum Blue Relic #/15. 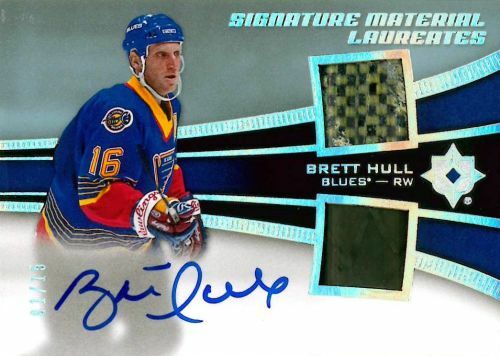 AUTO RELIC PARALLEL CARDS: Spectrum Silver Autograph Jersey #/99 or less, Spectrum Gold Autograph Patch #/25 or less, Spectrum Teal Autograph Relic #/25 or less. 70 cards. One rookie autograph or rookie autograph material per pack. AUTO RELIC PARALLEL CARDS: Spectrum Silver Autograph Jumbo Jersey #/149 or #/49, Spectrum Gold Autograph Jumbo Patch #/10, Spectrum Teal Autograph Shield 1/1 (Physical packs only). AUTO RELIC PARALLEL CARDS: Spectrum Silver Autograph Jersey #/99, Spectrum Gold Autograph Patch #/15, Spectrum Teal Autograph Shield 1/1. 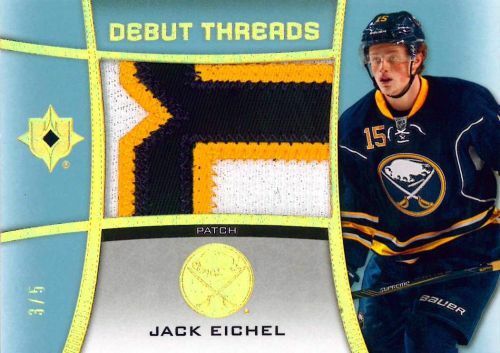 Jack Eichel card not autographed. *Some cards not found in base set. View specific options with the full spreadsheet. *Card #DT-RF not found in parallel. 26 cards. Serial Numbered #/99. *Card #ADT-AP found only in parallel. PARALLEL CARDS: Gold Patch #/10, Spectrum Gold Tag #/3. PARALLEL CARDS: Gold Patch #/25 or less (No card #SHM-DH), Gold Tag #/3. 20 cards. Serial Numbered #/65. PARALLEL CARDS: Gold Patch #/5, Gold Tag #/3. PARALLEL CARDS: Gold Patch #/15 or less, Spectrum Gold Tag #/3. Card #SIF-AP found only in parallels. View specific options with the full spreadsheet. 54 cards. Serial Numbered #/40. PARALLEL CARDS: Spectrum Silver Patch #/5, Spectrum Teal Shield 1/1. *Card found only in parallels. View specific options with the full spreadsheet. 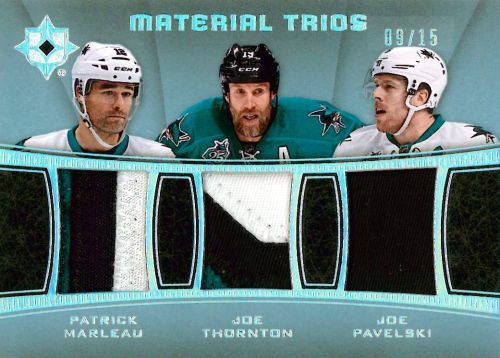 PARALLEL CARDS: Base Jumbo Jersey #/40 or #/15, Spectrum Teal Shield 1/1. PARALLEL CARDS: Gold Patch #/5, Spectrum Gold Tag #/3. PARALLEL CARDS: Gold Patch #/25 or less, Spectrum Gold Tag #/3. 21 cards. Overall odds - 1:10 packs. PARALLEL CARDS: Spectrum Silver Patch #/15 or #/10, Spectrum Teal Relic #/15 or less. 10 cards. Overall odds - 1:20 packs. 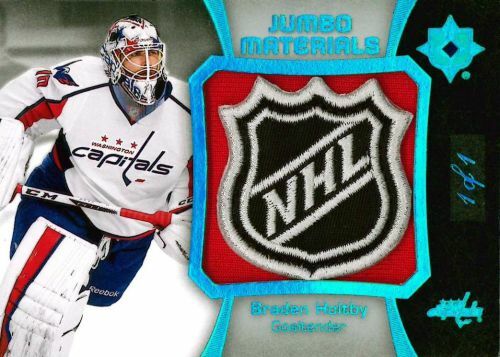 PARALLEL CARDS: Silver Patch #/15 or less. All subjects not included parallel. View specific options with the full spreadsheet. 10 cards. Overall odds - 1:30 packs. PARALLEL CARDS: Silver Patch #/10. 6 cards. Overall odds - 1:50 packs. PARALLEL CARDS: Silver Patch #/15 or #/10. 7 cards. Serial Numbered #/10 or as noted. 30 cards. Overall odds - 1:5 packs. 14 cards. Serial Numbered #/15. 27 cards. Overall odds - 1:25 packs. PARALLEL CARDS: Spectrum Teal Shield 1/1. I thought I would give this an early rating of one as I cancelled my preorder case. I’m sorry but the e-pack is killing the hobby for me. Get rid of online packs and I’ll revisit my rating after release. Paul, feeling foolish now that they announced that the 1/1 Shields will be physical Hobby box exclusives? Upper Deck has forgotten how to make their cards look good. So, all the other shields will be available on e-pack, except the rookie shields, correct? The fonts and logos used are horrible.. I can understand that if they are extra hits..
Used to be 1 auto, 1 rookie and 1 mem card for approx $100 – now they just add 2 $5-10 mem cards to make it 5 cards — and tripled the price..
all of the other vet star players – these cards are just overload.. they put in too many players again and again and again — at this price point to represent another ‘Hit” just to fatten their UD wallets. Just watched a couple case breaks. My 1st impressions are the design, cards & patches are weak. Small patches & single colors. 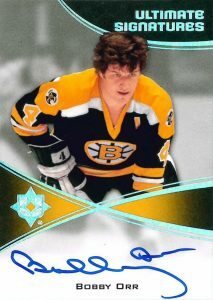 Only good cards I seen pulled were a 1/1 shield of Boston player & then a McDavid /99 auto. The shield was the nicest but even the McDavid was underwhelming. From what I’ve seen, I’m going to pass on this release & save up for Premier & Cup. Good luck to everyone else. This is another train wreck product UD has released in a long line of weak releases. Something to be said for consistency. Anyway, again, they raised the price and added rookie photo shoot em to justify the price. This is worse then Black, at least Black looks unique. Both were way overpriced, but this is shallow in not just value, but content and theme. UD is failing at the exclusive. STAY AWAY. Lots of cards look like they come with edge and corner damage. For most cards it won’t effect the value or design because 90% of the cards are worth >$10 and they look absolutely terrible, but in the case that you get a $100+ card, expect it to have some sort of damage. Man, I thought UD Black was bad — this takes the cake by far… Its a jersey overload product… Basically your paying $250 for a box of Contours crap lol…. Stay away from this at all costs. Ive watched so many 5 box inners opened today where the total value of cards in 5 boxes dont even equal the cost of 1 box. It is pure crap. 2-3 patches in a Master case at that price?? Thats HORRIBLE. You get the same about of patches & patch autos in SPA for 1/3 the price. Epacks is another way to stay away, because you have no idea what cards they held out for them. My theory was that they loaded the epacks with the patches cause of the shields being in the live boxes, but we will have to wait & see. This late in the 15-16 product run and SP Authentic & OPC Platinum are still hands down the best. Thats SAD. PANINI PLEASE COME BACK EVEN WITH NO LOGO LICENSE!! I watched more opened last night and it is by far Upper decks worst money grab this year, and that is saying a ton! Who gives the ok for these products? This is not ok and I am from this point done with UD. I can not for the life of me see how they keep the exclusive, maybe they don’t care? UD is like Trump, they keeping doing stupid thing after stupid thing. Maybe they don’t want to win? maybe they don’t want the exclusive? Yea, good luck case crackers. Wanted to buy a box or 2, just watched 3 diff case breaks. It is really poor stuff, & the quality is absolute crap. Everyone needs to email the NHLPA and tell them what a poor job UD is doing. Maybe a few thousand emails and they will smarten up next time licence is up for renewal. -1 stars! 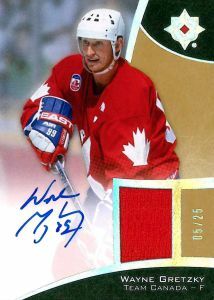 I got lucky though, and I had some decent pulls (Gretzky signed, Larkin RPA #/10, Ovi signed x 2, Perry Laundry Tag, Ladd Stick). Even there, this product is awful. Long story short, every single UD High-End was a huge loss of money. Even though I’m a seller, I understand and I expect to lose money with High-End products 9 out of 10 times. It is normal and I don’t expect to pull a McDavid in every single case, but when out of 4 High-End cases I pulled only 1 major rookie and payed something like 9000 $, there’s a huge, huge problem with it. Now, how to solve the problem? It is clear for me at this point that UD doesn’t give a penny on our complaints. They simply don’t care. People suggest to write them a public letter or a sort of petition. Do you guys think they don’t see all the bad comments and reviews they get all over the web? I’m pretty sure they have people hired to do a marketing research and get the feedback from buyers. In a nutshell, yes they are full aware of it. Then what’s the solution? Well, is plain and simple, DON’T buy High-End products anymore. Don’t buy boxes, cases, or break case. Let them remain on the shelves and let them lose big money. That’s the only way they will change, when it’ll hurt their pocket. As for myself, I was about to invest something like 2-3 case each for The Cup and Premier. They can forget about it. I will not spend one more penny on their High-End products. Sure, if only 2-3 people will do this, they will not feel it, but if 500 serious buyers will do the same they will start to feel it. To be fair, some of their low end products were not bad, but the High-End…unless they will change their policy, I will not buy anymore. @TCBoutique – I agree 100%! I would have to think that some of this is driven by their contract with McDavid. To me, that is the only way they could explain flooding the market with so many releases this year and cutting corners on the high-end stuff to make money. I am also not going to buy any cases, boxes or breaks of Premier of The Cup, just too little return for the money, or at least that is the precedence they are setting. Also, if we stop buying cases, boxes and breaks, Card Shops will have no choice but to up-channel that to UD. It might hurt the shops in the short term, but hopefully UD gets the message. T.C. and GeauxHawks. What you are saying is nonsense and you know it. 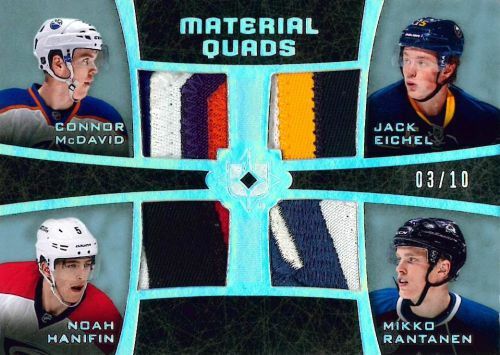 Nobody will stop buying high-end because of the incredible attraction caused by Mcdavid. Collectors are reliving the Crosby frenzy of 2005-06 and LOVING IT !!! You 2 might not buy The Cup and Premier but everybody else will. Don’t kid yourselves it won’t hurt UD one bit, and they will keep putting crap out there and laughing all the way to the bank. JP@ Well, perhaps you are right mate. It’s a nonsense in the way that not many people will stop buying. At the same time stating that only the 2 of us will stop buying, it may also sound as a nonsense. I’m pretty sure other stopped and more will. My provider tells me that he noticed a drop in the sells of the High-End products lately. McDavid or not, when people read this forum page for example with only 1 star reviews, they may get reluctant in buying Ultimate or Black for that matter or they will buy less anyhow. In the end, let the others buy all the crap…I’ll not. It was not my intention to start a crusade against UD, even though it may have sounded like this. I just gave an idea on the forum and joined in the discussion. The only thing I know is that I will not waste my money anymore. As for the others, they can do whatever they want. @JP, @TC – not trying to start a crusade against them either. I simply can’t afford to keep going after their high end product, which stinks because I started a Panarin PC, lol. I was going to stay away before I read TCs post, just happens he has the same idea. At the end of the day, I just want my money’s worth and UD is under delivering this year. Hopefully they do better next year. But, to echo what others have said, it’s inexcusable that a product of this price point has so many quality issues. My patch out of 10 had about a 1/4″ chip in the bottom. What can I do with that. In process of filing a claim with UD to see about a replacement card, but we’ll see. I have been doing this for a long time and have probably spent a half million or more on these shabby products. It is nothing more than legalized gambling and the true and ONLY way is to stop buying the product. This in turn will only hurt the stores and not upper Deck because of presells. They base production on this. Point blank is to stop gambling…..period.